Real-time analytics are important for staffing companies, or any organization for that matter. One way to review these analytics from within your staffing software is through dashboards. Dashboards allow users can see the information they need to make key business decisions at a glance. Anyone from Management to your Sales and Marketing team to your Recruiters can drive their decisions from these tools. Analytics dashboards allow you to assemble and present information from several places in your database in an easy-to-read format (graph, list, iFrames, etc.). This means that you do not have to search multiple areas for the information you need to make decisions. What a relief! Now you can quickly see where your candidates are coming from such as job fairs, referrals, your website, job boards, walk-ins, etc. You can also see the candidate status such as New, Available or On Assignment. Generate a list of the latest application records within the last 7 days, and have it updated automatically when a candidate applies for a job listed on your website. Recruiters can then follow up with the applicant to review their credentials or schedule an interview. Classify Active Candidates in your database and displayed them by the candidate rating you have assigned to them. This way your recruiters can easily drill down and see their hot, warm or cold candidates. 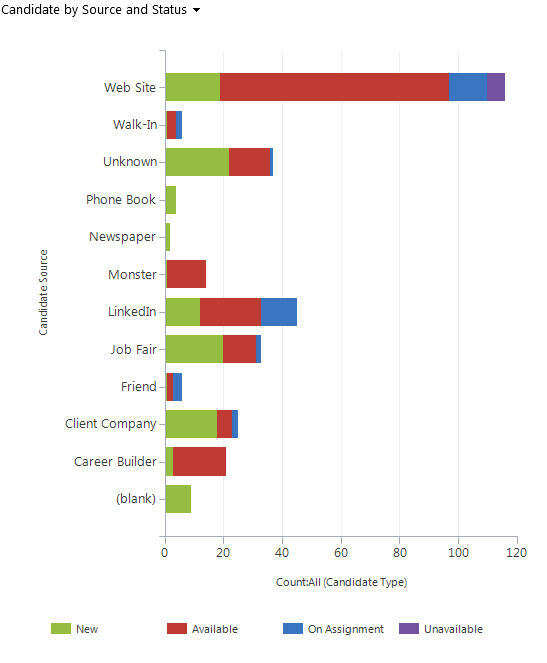 With a hotlist view of your candidates, recruiters can easily view and tap into resources deemed “hot”. These may be candidates with deadlines for placement, candidates with extremely desirable skills, or any other reason a candidate may be assigned a high rating. Keep on top of what is happening in your office with activity lists for you, your sales staff, and/or recruiters. These activity lists can include upcoming and completed tasks, appointments, interviews, and phone calls. Track your marketing spend and know exactly what marketing efforts are performing by monitoring Leads by Source. Quickly create a Marketing dashboard to view active campaigns and activities such as emails, newsletters, and mailers and view their response rates. Create an Executive Dashboard to view high level organization metrics – view pay/bill rates, jobs that have been filled by date, how many completed appointment, projected revenue, and goals. Want to see these dashboards in action? Check out this short video on creating dashboards in 1Staff Staffing Software for Microsoft Dynamics CRM. The video will highlight some of the types of dashboards previously mentioned; and shows how dashboards are easy to create and modify as your business needs change. One thing to think about when creating dashboards in your staffing software, is how you can interact with the data. In the video demo of dashboards in 1Staff and Dynamics CRM, you can see how you can click on areas of the graphs in the dashboards to see lists and individual records. This allows you to not only see the data from high level summary, but also interact with it and get to the details.